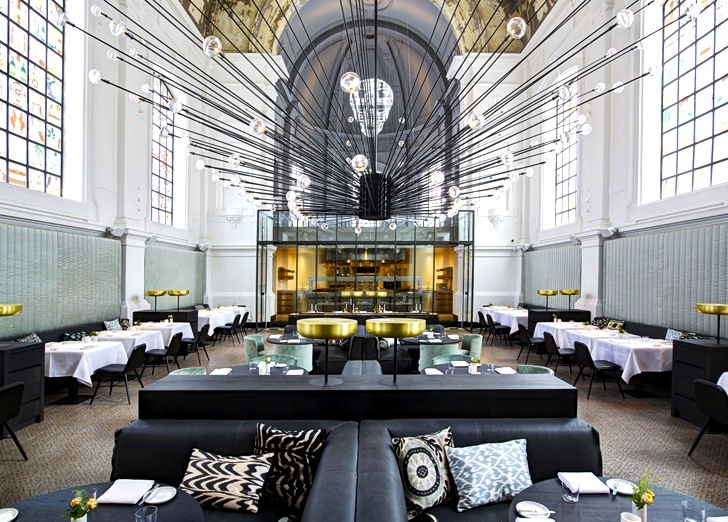 The Piet Boon Studio transformed an ornate historic chapel into a beautiful fine dining establishment in Antwerp. Headed by Michelin star chef Sergio Herman and chef Nick Bril, The Jane repurposes the chapel from a military hospital, while preserving elements of its history. 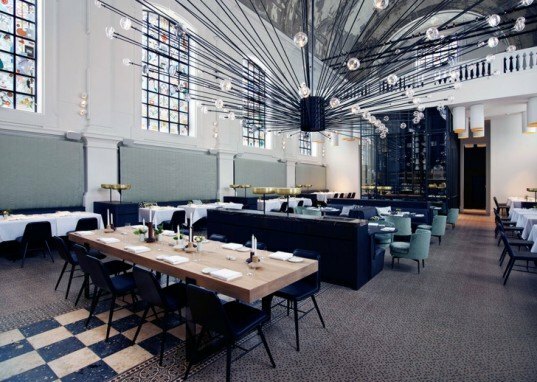 With a “fine dining meets rock and roll” theme, the designers updated the building with custom stained glass but left the original ceiling to pay tribute to the building’s history. In order to mesh a feeling of modernity with the historical interior, Piet Boon Studio decided to focus on preserving the ceiling as a focal point to represent the building’s past. Rather than stripping the weathered surface, the naturally aged ceiling was left as is with a beautifully textured pattern. The original ceiling can be admired from the Upper Room Bar, which has taken over the chapel’s balcony, creating a private space for enjoying a cocktail. The bar also overlooks the enormous chandelier designed by PSLAB. The chapel’s religious stained glass was removed and replaced with colorful modern windows designed by Studio Job, who used the chapel’s original function as inspiration. The 500 panels throughout the restaurant feature religious elements, like Jesus, crucifixes, skulls and devils, but also symbols of its new life as a restaurant, with ice cream cones, spatulas, apple cores and cakes. The windows filter in ample daylight, and also double as art work within the interior. The chapel’s new function as The Jane makes dining a divine experience, fusing an edgy interior with the beauty of a historic building. In order to mesh a feeling of modernity with the historical interior, Piet Boon Studio decided to focus on preserving the ceiling as a focal point to represent the building’s past. Rather than stripping the weathered surface, the naturally aged ceiling was left as is with a beautifully textured pattern. The original ceiling can be admired from the Upper Room Bar, which has taken over the chapel’s balcony, creating a private space for enjoying a cocktail. The bar also overlooks the enormous chandelier designed by PSLAB. The chapel’s religious stained glass was removed and replaced with colorful modern windows designed by Studio Job, who used the chapel’s original function as inspiration. The 500 panels throughout the restaurant feature religious elements, like Jesus, crucifixes, skulls and devils, but also symbols of its new life as a restaurant, with ice cream cones, spatulas, apple cores and cakes. The windows filter in ample daylight, and also double as art work within the interior.